Speaker of Parliament Mr Tan Chuan-Jin officiated at the launching ceremony of the Republic of Singapore Navy (RSN)'s fifth Littoral Mission Vessel (LMV), Indomitable, at the Singapore Technologies Marine (ST Marine)'s Benoi shipyard today. The LMV was launched by Mrs Tan Lik Ling, wife of Mr Tan. Speaking at the ceremony, Mr Tan highlighted how the RSN has progressed over the last 50 years. He said, "The LMV demonstrates how the RSN continues to strengthen its capabilities for the future and continues to safeguard our sea lines of communication. At 50 years, the RSN has come a long way since her humble beginnings, with just two wooden boats, to today's professional and well-respected maritime force." He credited the RSN's achievements to the indomitable spirit of its people and entrusted the Commanding Officer and his crew the honourable duty of living up to the ship's name. "The journey to build a capable Navy was not easy. We stand on the shoulders of generations of sailors who have helped built our Navy and have kept our waters safe." 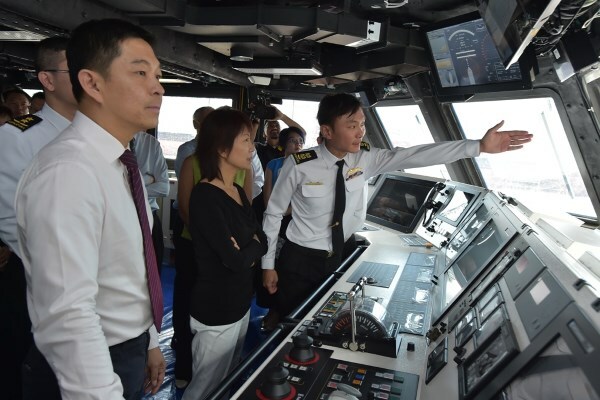 The launch of the LMVs is a significant milestone in the RSN's continued transformation to keep Singapore's seas safe. The LMVs are faster, more versatile, and equipped with sharper capabilities to further strengthen the RSN's effectiveness in seaward defence. The LMVs can be quickly configured with mission modules to take on a wide spectrum of operations, allowing the crew to deliver calibrated responses using lethal and non-lethal options to deal with a range of maritime threats. The LMV programme is progressing well. The first LMV, RSS Independence, was commissioned during the RSN's Golden Jubilee on 5 May 2017 by Prime Minister Lee Hsien Loong. RSS Independence was most recently involved in search and rescue efforts for the missing crew of the Dominican-registered dredger JBB De Rong 19 that collided with Indonesian-registered tanker Kartika Segara. The other three previously launched LMVs, Sovereignty, Unity and Justice are presently undergoing sea trials. Also present at the ceremony were Chief of Navy Rear-Admiral Lew Chuen Hong, and senior officers from the RSN and the Defence Science and Technology Agency. Indomie table LOL. Such a great name. May be that singapoor hero, similar to our light fregat KRI Usman-Harun. Usman and Harun are Indonesian hero. Angka NOL itu hebat lho...buktinya gegara beda satu angka NOL aja bisa bikin "bhayangkari yang kebelet" kepleset kulit pisang. Masak 500 dibilang 5000...ya berabe dong, udah terlanjur diviralkan pula. Singapore bases tempat pelarian para kruptor kakap terus berbenah sedia payung sebelum hujan .negara kutu singapore laut saja masih numpang tapi kok bisa punya angkatan laut dan udara paling maju di kawasan asia tenggara . Besok2 pake nama kapal api..ngupi2 yuuukk haha!